I've been iffy about the longevity of geometric everything for awhile now, but it doesn't seem like it's going anywhere. Uncle, I cry! The simple lines and representative shapes are fairly easy to recreate and the result looks clean and crisp, especially at a small size. So, I decided to embrace the trend by marrying it with the classic look of fused glass and a holiday ornament using...wait for it...Shrinky Dink plastic. Art of your choice, sized to fit an 8.5" x 11" piece of copy paper. NOTE: Shrinky Dink paper is sized at 8" x 10" so adjust your image accordingly. Ranger Melt Art Ultra Thick Embossing Enamel (aka: UTEE) This is what makes the ornament look like glass. It also acts like a glue and holds the dimensional pieces in place. Begin by creating your design. You can draw something on a standard sheet of 8.5 x 11" paper, or print out an image you found online. Once you have your art, tape it to the shiny underside of one sheet of Shrinky Dink paper. My design is based on Hug a Porcupine's snow fox brooch, which is totally adorable. 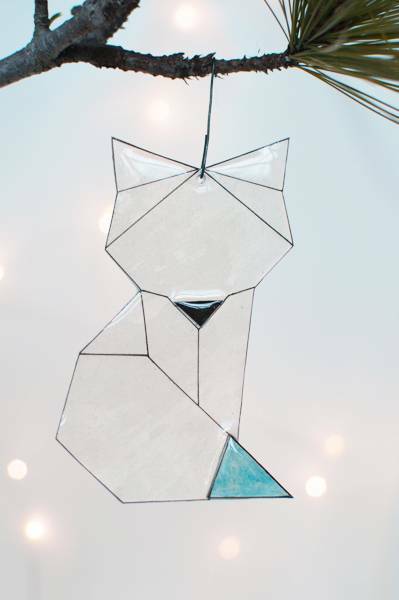 For other ideas that might work, check out these fabulous animal shapes. Using a ruler and the black pigment ink marker, trace all the lines of your art. To give the ornament a fused quality, choose elements from your art to make it dimensional. For this image, I used the tip of the animal's tail and his nose, the nose being a great dimensional element for any animal. Use some of the scrap shrink plastic to outline the sections you want to pop--literally--and cut them out of the plastic. Using the pigment ink markers, color in each section. Tip: If the black border around the your colorful piece gets smudged, you might want to retrace the outside perimeter of the segment. Pre-heat oven to 300 degrees Fahrenheit. 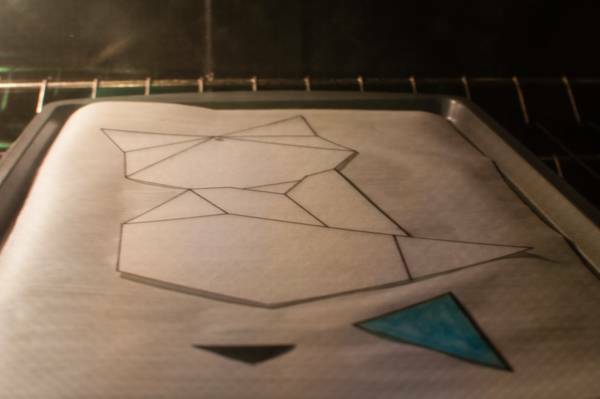 Place the plastic pieces - outline and colored sections - on a baking sheet lined with parchment paper and bake until the plastic shrinks to about 50% of its size and is completely flat. (If you're unfamiliar with Shrinky Dinks, you'll probably panic a bit at this point because the plastic curls upon itself when melting. But don't worry. The art should right itself and flatten out. After you've taken the your art and all it parts out of the oven with an oven mitt, quickly put another piece of clean parchment paper on top of the pieces and press down lightly on the image to flatten them. You only have seconds to do this! For comparison, check out the size of the image after shrinking compared to the original pattern I used. Also note the intensity of the robin's egg blue. After the pieces cool, position the colored accent pieces on top of the larger image. Gingerly, sprinkle a light to medium coating of UTEE over everything and place it back into oven on a lined baking sheet. Keep an eye on the ornament until all the UTEE is melted. (In the photo above, you'll notice that the UTEE has melted around the perimeter but not in the middle. Don't remove the ornament from the oven until ALL the UTEE is melted.) THE UTEE WILL MELT OVER THE EDGES OF THE IMAGE. THIS IS EXPECTED AND WILL BE DEALT WITH IN STEP 12. When you take the ornament out of the oven, quickly check to make sure all the dimensional pieces on top of the larger piece below are straight. If they aren't, use a toothpick to realign them. After the UTEE has set up a bit, inspect the ornament for any inconsistencies. You'll see in the above image that the left ear didn't get embossed very well. No worries--we're going to do another coat of the embossing powder. Sprinkle the UTEE over the entire image one more time, and place back in the oven. Keep an eye on the ornament until this second layer of the UTEE has melted completely. After the UTEE has cooled, you'll need to trim the excess UTEE that has melted over the edges. You CAN use a scissors to cut the UTEE, but I find breaking it off--FROM FRONT TO BACK--works best for me. When you're done with the big bits, you'll have some jagged bits. You can use a straight craft blade to shave them off, but I find my fingernail works pretty well too. When you're done trimming the excess UTEE, you'll probably end up with some rough spots on the FRONT of the image. Don't worry. Just pop it back into the oven and let the UTEE melt ever so slightly. Doing so will fill in the rough spots and smooth everything out. It kind of works like when you "flood a cookie" with icing. When you take the ornament out of the oven this time, you'll have to re-ream the hole at the top--again, do this when the UTEE has set but is still slightly warm. Add a hook or string to the hole and display as desired, letting all who cast their gaze upon it admire your mastery of making a faux fused glass ornament. amazing and nice idea..., i m definitely gonna try it.. Some organizing bins would be on my list if I win. @ Sawan, I filled in the individual parts to apply them to the top of the image, giving it dimension. Without these parts, the finished ornament wouldn't look like fused glass. The UTEE is a thick embossing powder that makes the plastic look like glass when it's melted. (It's super thick and shiny.) It also holds the top pieces to the bottom pieces. Why do the coloured parts separate? Why not just colour in the section on the main image before you shrink and what is the purpose of the UTEE?